In part 7.1 of this topic, you learned how easy it is to create components that make up a family. You should now be comfortable with the Forms tools. If you dug further into the Properties palette, you should have discovered many more useful options inherent to the Forms tools. We are now going to take a family to the next level by applying parameters. 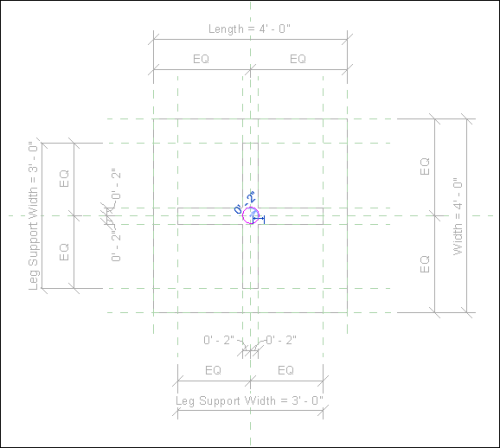 Parameters are formulas and mathematical equations embedded into a Revit family that control its properties, including length, width and depth (see Figure 1). Parameters also can control the appearance and visibility of family components. Thus, when the family is loaded into a project, a user can change the way the family looks and behaves. This is a powerful feature of the Family Editor that sets it apart from other 3D modeling applications. While this may sound complicated, in reality, it’s not. There are only a few simple rules to follow. This article will teach you the basics of creating family parameters. 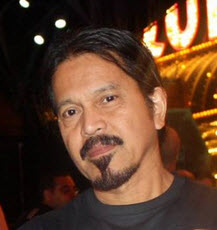 In Ref. 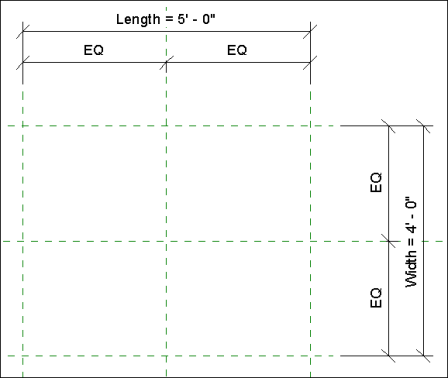 Level view, sketch and dimension the reference planes in the numerical order (just for this exercise) indicated in Figure 2. 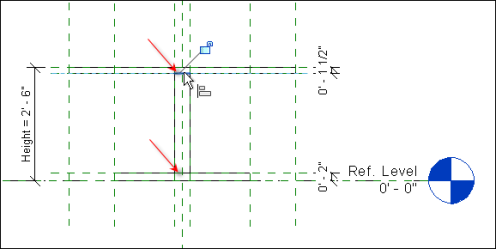 Take advantage of the temporary dimensions to center the reference planes from the default reference planes. Figure 2. Reference planes for tutorial. Click the 5' – 0" dimension. 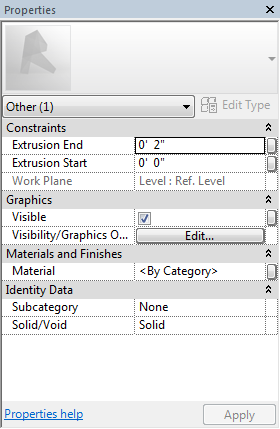 In the options bar, click the Label drop-down menu and then select <Add parameter…> (see Figure 3). Figure 3. The Add parameter option. This opens the Parameter Properties dialog box (see Figure 4). Under Parameter Data, type Length in the Name field. Click the Instance button and then click OK. Figure 4. Parameter Properties dialog box. You’ve just created a dimension parameter called Length (see Figure 5). 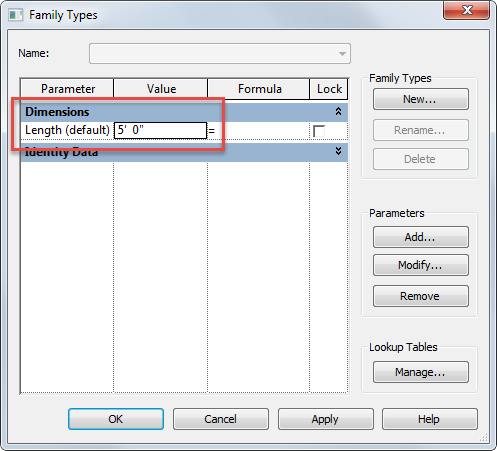 Now click the Family Types button from the Properties panel of the Modify tab (see Figure 6). Figure 6. Family Types button. This opens the Family Types dialog box where the dimension parameter you just created appears under the Dimensions column (see Figure 7). Figure 7. Family Types dialog box. As you might have guessed, if you change the Length value, the reference planes in the drawing area will update. Try it. Move the dialog box on the side so you can see the drawing area. Change the Length to any value and then click the Apply button. You should see one of the reference planes move. Click OK and then do an Undo command a few times (Ctrl + Z) to change the Length back to 5' – 0". If you noticed, the change in length was made from where you clicked the first reference plane (the number 1 reference plane in Figure 2). 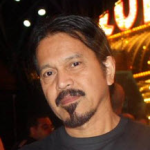 But what we want to do is enable the reference planes to grow from the center default reference planes. To accomplish this, place a string dimension as shown in Figure 8 and then click the EQ symbol with a slash. 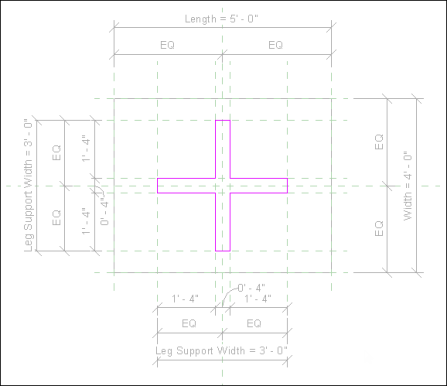 Revit refers to this symbol as the Equality Constraint. The values in the string dimensions change to EQ, and the slash in the equality constraint symbol disappears (see Figure 9). Figure 9. The result after clicking the equality constraint symbol. In this case, the equality constraint feature will enable the Length dimension to grow from the center default reference plane when the value is changed. So let’s try flexing* this parameter. Click the Family Types button and then change the Length value to 10' – 0". Notice that the reference planes stretched from the center (see Figure 10). Flexing in Revit is synonymous with testing. This is done to ensure the integrity and stability of the parameters as more of them are added to the family. It is a good practice to flex any parameter you create to ensure they work properly. Figure 10. Dimensions grow from the center using the equality constraint feature. Now it’s your turn. Click the 4' – 0" dimension and create an instance parameter called Width. Place a string dimension between the horizontal reference planes and then click the equality constraint symbol. Your family should look like Figure 11. Flex this new parameter before continuing on with this tutorial. Figure 11. 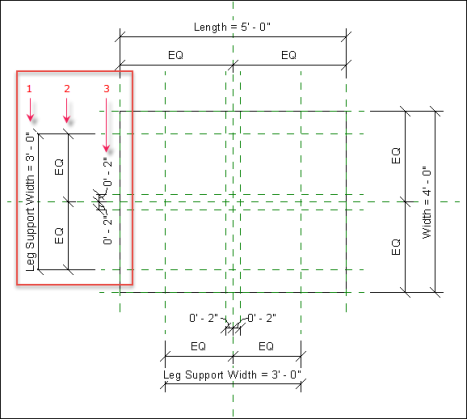 The completed Length and Width parameters. Figure 12. Adding reference planes from the Front elevation. Click the 2' – 6" reference plane and then name it Tabletop from the Identity Data -> Name in the Properties palette (see Figure 13). Figure 13. Naming a reference plane. Flex the Height parameter. Notice that the 0' 1 ½" locked dimension follows the height value entered in the Family Types dialog box. The 2" dimension also remains stationary. This is one way of constraining dimensions. Figure 14. The Parameter Properties dialog box. When a selected family in a project contains Type parameters, the specific parameters appear in the Type Properties dialog box when the Edit Type button is clicked from the Properties palette dialog box. Therefore, if there is more than one instance of the family in the project, all the type parameters (for example, materials) of those instances will change (see Figure 15). Figure 15. 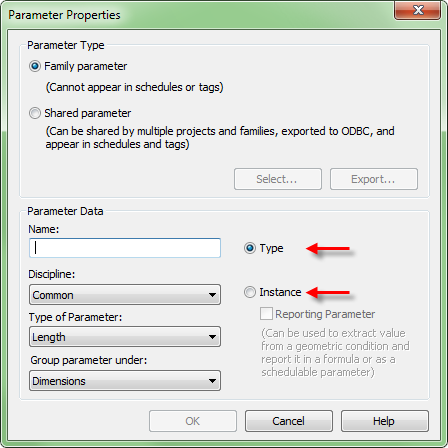 Parameters in the Type Properties dialog box. 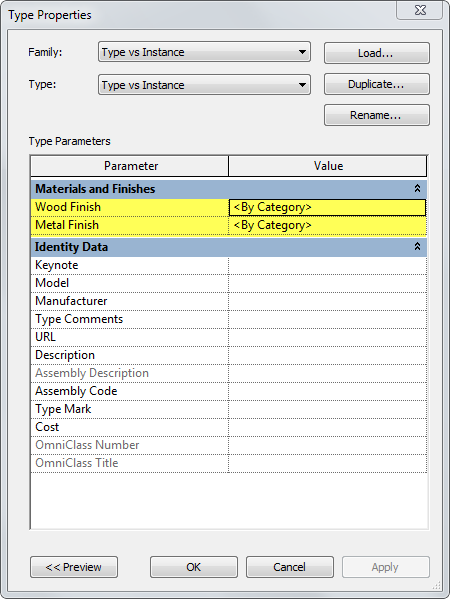 When a selected family in a project contains Instance parameters, the specific parameters are displayed in the Properties palette (see Figure 16). There’s no need to click the Edit Type button. Therefore, if there is more than one instance of the family, only the selected family will change its instance parameters. Figure 16. Parameters in the Properties palette. 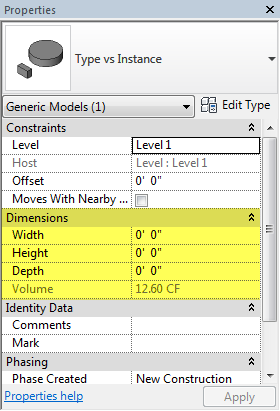 Now that we’ve laid out the framework from which to model our components, we will now associate the dimension parameters to forms we are about to create that make up a simple parametric table (see Figure 17). Go back to the Ref. Level view. We’ll start with the tabletop. Click the Work Plane button (Create -> Work Plane). 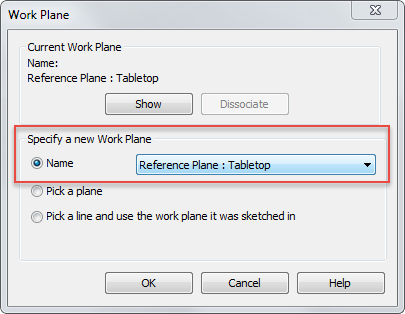 In the Work Plane dialog box, select Reference Plane : Tabletop from the Name option (see Figure 18). By doing this, we will be sketching from the Tabletop reference plane that we assigned in Figure 13. Figure 18. Reference planes for tutorial. In the Create tab, select the Extrusion tool from the Forms panel. 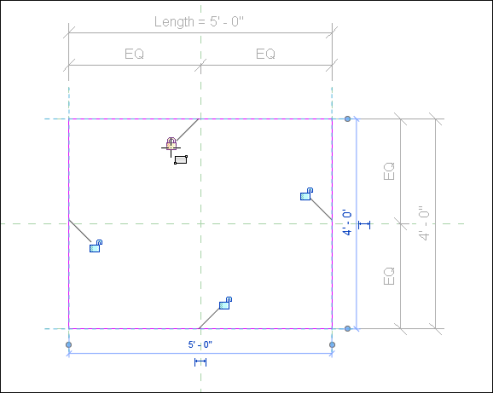 In the Draw panel of the contextual menu, select the rectangle tool and sketch a 5' x 4' rectangle on top of the previously drawn reference planes. You’ll notice that after sketching the rectangle, four open lock icons appear. Click each one to lock them (see Figure 19). This locks the magenta lines on top of the reference planes. Next, exit the sketch mode by clicking the Finish Edit Mode button. Figure 19. Locking line segments to reference planes. While the tabletop is still selected, enter a value of 0' – 1 ½" in the Constraints -> Extrusion End field of the Properties palette (see Figure 20). Click the Finish Edit Mode button to exit the sketch mode. Figure 20. Entering thickness values in the Properties palette. Now flex the parameters. Click the Family Types button (Create or Modify -> Properties). 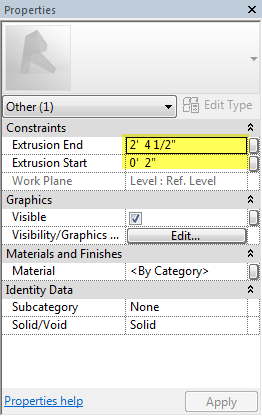 Change the values of the Length and Width dimension parameters and then click the Apply button. You’ll notice that the extrusion form updates to the new values. Click OK and then press the Ctrl + Z key a couple of times to undo the change. Double-click the Front elevation from the Project Browser. Go back to the Family Types dialog box and then change the value of the Height. Click OK and then undo the change you made. 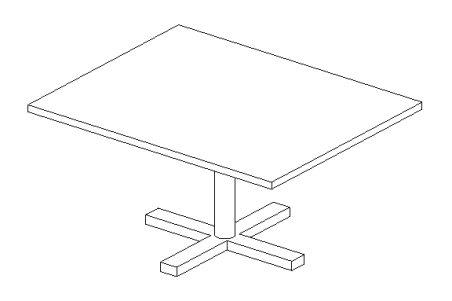 We are now going to add the remaining parts of the table: a leg and leg support. In the View Control bar, change the visual style to Wireframe (see Figure 21). Figure 21. Wireframe visual style from the View Control bar. Create the overall Instance dimension parameter first (1). Add the dimension string and then click the equality constraint symbol (2). Add the 2" dimension string (3) and then click the open lock icons to lock them. Do this same procedure for the south side of the tabletop. But instead of creating the Leg Support Width parameter, just select the 3' – 0" dimension and then choose the previously created parameter from the Label drop-down menu in the options bar. Figure 22. Adding more reference planes and dimension parameters. Now let’s create the leg support. Click the Set button from the Work Plane panel and then set the work plane to Ref. Level. (see Figure 23). Figure 23. 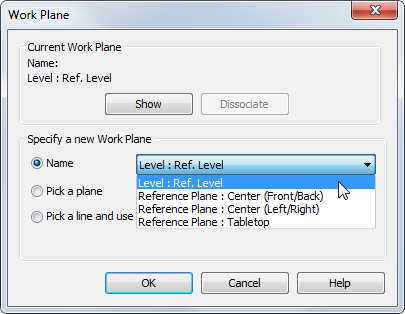 Choosing a work plane from the Name option of the Work Plane dialog box. Click the Extrusion tool (Create -> Forms). 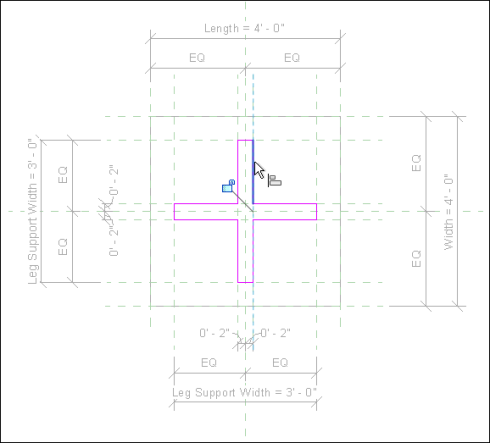 Using the Line tool in the Draw panel, sketch the leg support as shown in Figure 24. Figure 24. Sketching the leg support. Specify the thickness by entering 2" in the Constraints -> Extrusion End field from the Properties palette (see Figure 25). Figure 25. Specifying thickness constraints in the Properties palette. Unlike the rectangle tool, the line tool does not display an open lock icon after a line is sketched on top of a reference plane. It displays an open lock icon momentarily, but it disappears when you try to click it. However, it can be locked after a form has been sketched, either while in sketch mode or after clicking the Finish Edit Mode button. This is done with the use of the Align tool. For the above example, let’s do the procedure while in sketch mode. Click the Align tool from the Modify panel of the Modify tab, or type the keyboard shortcut AL. Now select a reference plane and then click a line segment on top of it. An open lock icon appears (see Figure 26). Click it to lock the line segment with the reference plane. Figure 26. Aligning line segments with the reference planes while in sketch mode. Do these procedures for the remaining 11 line segments and then click the Finish Edit Mode button. Alternatively, you can click a line segment with the Align tool first and then the reference plane. Also, you can do the align process after exiting the sketch mode by clicking a reference plane and then an edge of the extrusion. Before we proceed with the last component, flex the Leg Support Width parameter and then undo the change. If you get an error message or the form does not flex properly, make sure the line segments of the leg support are locked to the reference planes. Using the Extrusion tool, sketch a circle with a radius of 2" at the intersection of the default reference planes (see Figure 27). This will be the leg of the table. Figure 27. Sketching the table leg. In the Properties palette, enter the height constraints of this leg as shown in Figure 28 and then click the Finish Edit Mode button. Figure 28. Entering the height constraints in the Properties palette. Double-click the Front elevation from the Properties palette. Click the Align tool and then select the top edge of the circular leg (if you have to, press the Tab key to select it) as shown in Figure 29. Select the reference plane behind it and then click the lock icon. Do the same for the bottom edge of the circular leg. Figure 29. Locking the leg's top and bottom edges to the reference planes. 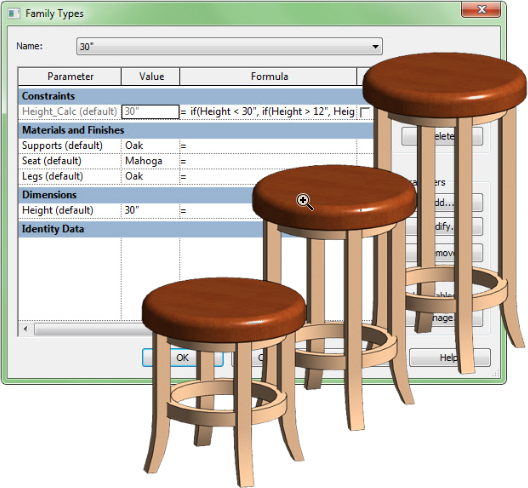 Click the default 3D view and then flex the parameters of the table from the Family Types dialog box. That’s it! You’ve just created a parametric table. The essence of creating parameters in a family is building the framework first using reference planes. Then components are attached and locked to them. That’s how a family changes its dimensions when loaded in a project. Just as you would in building your components, being creative is the key to assigning useful parameters. There is no set rule. You can lock certain parts so they are constrained to their locations according to the rules you define. You can also apply conditional formulas. You can nest different parts of a family inside the main family so they move as one unit. What is presented here is the basic knowledge you need to get started in creating parametric families. YouTube has tons of tutorials dealing with this subject. Do your research, and most of all, sit down and create parametric families to get some hands-on practice. No amount of tutorial will enable you to fully understand the principles behind these techniques until you actually have a hand at creating your own parametric family.